Our Lifting and Hoist nets (including cargo box hoist nets) are ideal for use on building and construction sites, shipping docks and in warehouses as they are strong and hardwearing. They are generally used to load and unload cargo using a lifting method that draws the corners of the net around its load. The net is gathered to a point whilst being lifted and therefore this provides a secure and balanced lifting mechanism for the cargo. 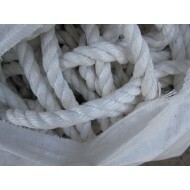 The nets adapt to the shape of the load, and therefore can be used with uneven or bulky loads. This ensures damage to any cargo is minimised and contained within the net and provides an element of personnel protection.  The netting must be used by a competent person. 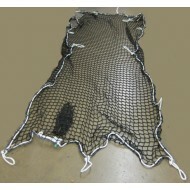 The nets are available as a flat net or as a box net and comes with a border rope with four eyes. Some of our nets are manufactured to conform to EN-1236-1 and comply with stringent UK and European regulations and will also show the EN Safety Mark and come with a Certificate of Conformity. Although the nets are high quality and durable, they should be visually inspected before use and should not be used if there is evidence of damage. 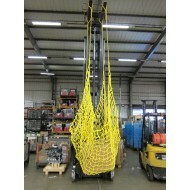 Please contact us for more information about our extensive range of stock and bespoke hoist nets for lifting and securing equipment. 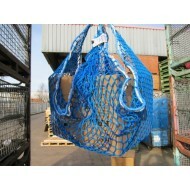 These nets are ideal for lifting loads up to 1 Tonne and can also be used as heavy duty lo.. 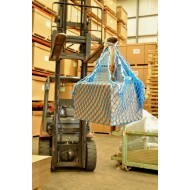 These nets are ideal for lifting loads up to 1 Tonne Payload and can also be used as heavy.. These nets are ideal for lifting loads up to 200 Kg and can also be used as heavy duty load restrain..
Made with 20mm woven Polypropylene Rope with a 200mm Mesh, this Hoist/Lifting Net is one of the stro..
Made with 18mm Yarn Construction (BSEN ISO 1346:2004) and 8mm Yarn Construction, with a 150mm ..